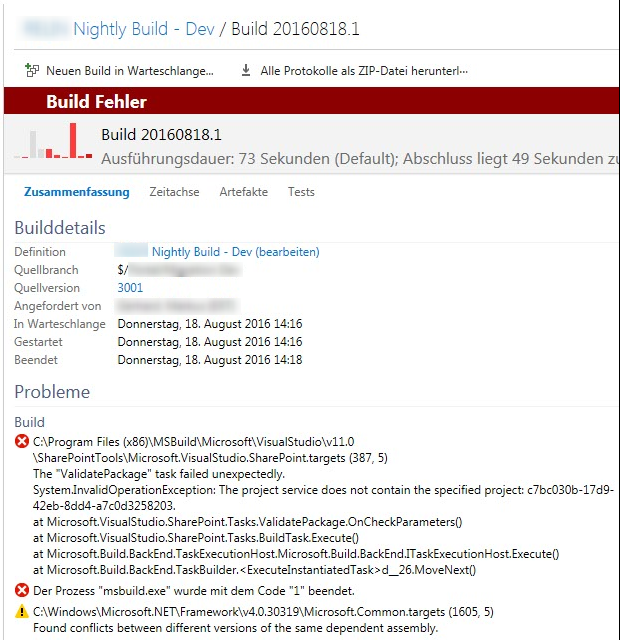 When configuring my Build Service on TFS 2015 I received the following error message when building my SharePoint WSP with the build service. The "ValidatePackage" task failed unexpectedly. System.InvalidOperationException: The project service does not contain the specified project: c7bc030b-17d9-42eb-8dd4-a7c0d3258203. I have tested a few fixes mentioned on the web as installing Office Developer Tools for Visual Studio 2012* or Open the *.csproj in a text editor and look for the <ProjectTypeGuids> entry and make sure the guids are listed there*. Nothing worked for me until I figured out a really stupid configuration setting that is quite obvious but I have overlooked. Our SharePoint 2013 solution was created with Visual Studio 2013 and within the vNext Visual Studio-Build I had configured the Visual Studio-Version 2012. I just needed to set the correct version and it worked like a charm. *opens an external link in a new tab.